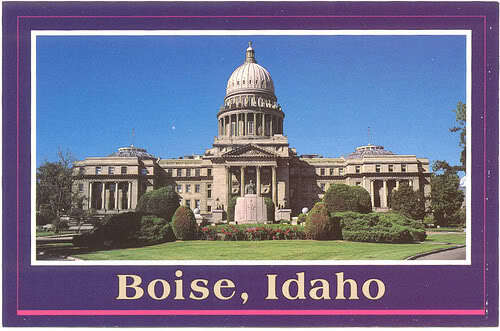 Well, I'm pretty much settled into my new home with Scott here in Boise, Idaho. I have to admit, I really like the area. With the rain they've been getting here, the mountainous views are breathtaking, and compared to Altoona, there's a LOT to do around here, as well as lots of job opportunities. Right now I'm only looking for part time work, as I want to be able to spend as much time with Liam this summer as possible. Plus I want to be able to enjoy the weekend we get married with our friends and family without having to take time off a new job. I'm slowly coming into my role as more of a "housewife". Getting up in the morning to take him where he picks up the commuter van that takes him to base, cleaning, cooking and taking care of things so that it frees up his little time at home during the work week. I know he's trying to get used to it as well. We are both very independent, proactive people when it comes to a lot of things, so it's difficult to "let go" and allow the other to do things for us. That will come in time. It's not like it's a bad thing, just different. I knew I could never be a full time housewife, but when Liam comes, and in the future some little ones, that may change. Right now though, I've only been here barely 7 days and I'm already feeling the itch to work outside the home and earn a paycheck. My kittybutt, Shamrock, is loving his new home as well. We have a large deck off the unit, and he loves being able to be outside and lounge in the sun. Scott has a basset hound, Wallyse, who I've taken for a couple walks around the complex grounds. Today, the bedroom furniture that Scott ordered for Liam will be delivered, and hopefully afterwards I'll be able to go check out the workout room. Scott says it's not much, but if there is a good bit of floor space there, it will be nice to take his portable DVD player down with my workout DVD's instead of trying to do them at the apartment. As spacious as this apartment is, Scott has an over sized living room set. It's really nice, but really BIG!! It was nice to spend Memorial weekend with my parents. I got to see Liam and my niece, Hannah, as well as my sister and her family. Liam and I headed to visit my best friend, Wendy, and afterwards, we went to the Irish Fest at Gaelic Park in my hometown of Oak Forest, Illinois. I had not been to the Irish Fest probably in 15 years. Liam rode some rides, and we played games, and listened to music, and of course we HAD to have some funnel cake!! We also took the time to go to the cemetary to visit my brother, grandpaps and uncle. We went swimming, and the kids fished, and we also went to a small parade on Memorial Day in Rockdale, where my bro-in-law is a volunteer firefighter. They had a nice memorial service, and we headed back. The journey to Boise was LONG! I left about 8:30pm central time, and took a small 2 hr catnap at a rest area, and then drove through Iowa, Nebraska, and Wyoming until about 2pm Tuesday and got a hotel room. I got a good 16-17 hrs of drive time in. I rested and me and Shamrock headed out that evening through Utah and Idaho, arriving in Boise around 11am mountain time. Scott was supposed to be at work, or at least that's what he lead me to believe as I passed Mountain Home AFB into Boise, but he was there to greet me, and it was just a great couple days catching up, unpacking and getting settled in. I just wanted to thank all my friends and family for their love and support with this major decision I made with my life. It's a great feeling to know that people are behind you and just want to see you happy, and know you deserve to be happy. Well, I'm going to wrap it up for now. I should be able to catch up with everyone soon! Love you guys!! *hugs* Enjoy your week!! Wow! I'm glad to hear everything has been working out so well ^_^ Keep us updated! So happy for you Cher! It takes time to settle in but you are moving forward & that is what counts! Very exciting!